"Delicious right off the grill! Take care not to overcook the steaks, as tuna can quickly become quite dry." Stir soy sauce, rice wine, ginger, and garlic together in a shallow dish. Place tuna in the marinade, and turn to coat. Cover dish and refrigerate for at least 30 minutes. Remove tuna from marinade and discard remaining liquid. Brush both sides of steaks with oil. Cook tuna on the preheated grill until cooked through, 3 to 6 minutes per side. I substituted rice vinegar and sherry for rice wine vinegar and it added a great flavor! absouletely perfect tuna! it was so tender and flaky - the marinade definitely did the trick, although i added a touch of lime juice. Delicious marinade! I pan fried the tuna with a small drizzle of oil for 3 minutes per side. That left the steaks pink in the middle, with great flavor and texture. Great recipe, really good marinade. Just make sure you get high quality tuna because tuna can taste pretty fishy, and I subsituted sherry for the rice wine and it tasted great. 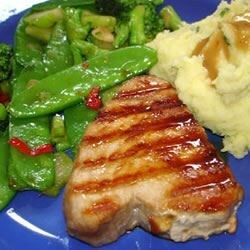 Wonderful recipe,I let my tuna marinade over night. It tasted fantastic. It went really well with warm cous cous. This is the best tuna marinade I've come across! We make this at least twice a month now. Thanks! Tried it for the first time tonight and loved it. I think I will let it marinade longer the next time I cook it, though.